← Can the European Union Save the Independent Judges? The past decade has been one of the most turbulent times in the process of European integration. In this period, the European Union has risen to the stars and fallen back from the heavens. The beginning of the new millennium was marked by enviable achievements. The EU carried out a successful enlargement to the East. It adopted a single currency and experienced a boom in economic growth. The objective, laid down in the Lisbon strategy, was to make the EU “the most competitive and dynamic knowledge-based economy in the world, capable of sustainable economic growth with more and better jobs and greater social cohesion.” This goal ought to have been met by 2020. However, the developments taking place since 2000 have made the attainment of this objective anything but possible. Rather than becoming the leading economy in the world, since 2009 the EU has been in permanent economic crisis. And, while the crisis has been tamed, it is far from resolved. Its consequences for the most affected member states in the South and in the East have been grave. They have shaken up the foundations of the well-ordered societies that these member states have at least tried or pretended to be. The outcome has been a deep political crisis. It has unleashed an unprecedented wave of populism, resulting in a backlash against national and supranational elites. In several member states, democracy and the rule of law have come under strain. The achievements of constitutional democracy have been rolled back and the very value foundations on which the Union has been built have been seriously undermined. The unfavourable geo-strategic environment, both to the Union’s East and South, has exacerbated the crisis. The influx of refugees and migrants from the Middle East added a humanitarian dimension to it. The unprecedented terrorist attacks in several member states complemented the crisis with a security component. All this has, directly and indirectly, influenced the British voters to decide in favour of leaving the Union. The Brexit decision has thrown the EU in yet a bigger political turmoil, straining the integration to the point at which its very existence seems to have come into question. Not unexpectedly, in this unhappy decade the main preoccupation of academic and political actors alike has been to identify the remedies for these crises in order to return the EU to a path of stability, growth and prosperity. Both in theory and in practice, the question most typically asked has been how an effective response to the crises can or should be developed within the EU, i.e. with regards to its institutions and on behalf of its member states. The crisis-resolution focus has thus been an internal one. It has centered almost exclusively on improvements of the EU’s organizational structure and its overall functioning. While this internal focus is justified, it is inadequate, as neither the origins of the EU’s crises nor the solutions to them are exclusively internal to the EU. Therefore, in my book, I propose a different approach which takes into account that beyond the EU, there are jurisgenerative actors of varying legal status (public, private and hybrid) which importantly affect the EU’s internal functioning as a whole and challenge its capacity to function as a well-ordered polity. These actors operate transnationally and the norms created by them have been called transnational law. It is against this highly topical backdrop that the book proceeds to focus on the relationship between the European Union and transnational law. EU law on the one hand and transnational law on the other have already received quite an extensive, yet seperate treatment in legal scholarship. However, they have rarely, if at all, been addressed together. Not only is the book thus topical, it is also novel and its focus is original at least in a double sense. First of all, it is original since transnational law is a relatively recent phenomenon and its challenges to the European Union are therefore qualitatively new and under-researched. While the literature on the law beyond the state and on other types of non-statist law has been flourishing at least since the late 1990s, it has been predominantly focused on the question of the meaning of new types of law(s) and governance through law for the law of individual states. The same question, however, has not been posed with regard to the EU which is itself a non-statist, post-national and therefore transnational entity. Second, challenges to the functioning of the European Union have traditionally come from the member states. These internal challenges and the answers to them have been gathered in a huge and still growing body of literature devoted to EU constitutional law lato sensu. Transnational law, on the other hand, poses challenges to the EU, which are external. They are operating in a direction outside-in, instead of inside-out, where the traditional focus has been centred so far. While the EU’s internal challenges have by far not been resolved and not even sufficiently addressed yet, the newly emerging external challenges are making this task even more difficult. A holistic understanding of the process of European integration therefore requires complementing the internal constitutional dimension with the external transnational one. 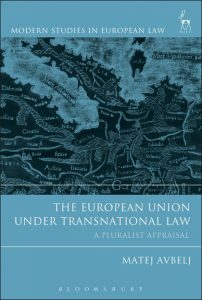 The book therefore addresses the question of the relationship between EU law and transnational law from an original theoretical perspective of principled legal pluralism. The interest in this relationship does not merely grow out of an abstract, theoretical curiosity as to how to structure, relate and conceive of these two phenomena together. It is instead derived from concrete practical problems that transnational law has recently posed to the EU with respect to the rule of law, democracy, human rights protection and justice. These four values stand for qualitative standards that any polity has to meet to qualify as a well-ordered political community. The EU is no exception. It has proclaimed these standards as its foundational legal values, enshrined in Article 2 TEU. 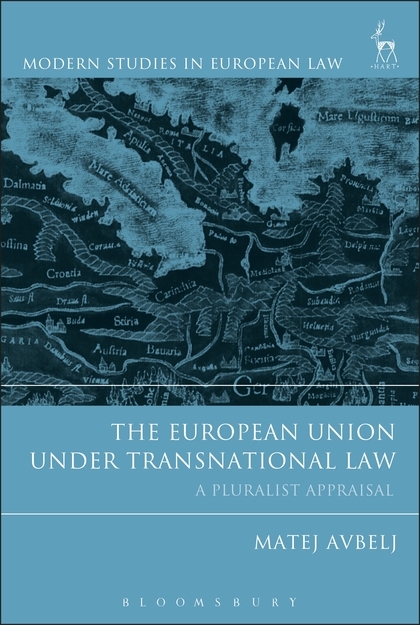 As the rule of law, democracy, human rights protection and justice are thus at the heart of the functioning of the EU, they have been chosen as a natural point of departure for the book’s four case-studies in which the impact of transnational law on the EU is examined and theoretical conclusions are drawn. This conclusion is reaffirmed by the fact that the EU, largely due to its specific legal and political nature, has not been particularly good at implementing its foundational values. The literature blaming the EU’s constitutional structure for all kinds of deficits in the rule of law, democracy, human rights protection and justice is burgeoning. However, the present, apparently insufficient capacity of the EU to address and remove its constitutional deficits is bound to deteriorate further because of transnational law’s external influence. One of the main normative concerns of the book therefore is how to prevent and/or reverse a negative spiral, in which the internal and the external dimensions of the European Union’s functioning keep feeding the vicious circle of its rising constitutional deficits. Hart Publishing, Oxford/Portland, 2016. 192pp. This entry was posted in Book and tagged Article 2 TEU, Crisis, Democracy, European Union, Human Rights, Rule of Law, Transnational Law. Bookmark the permalink.